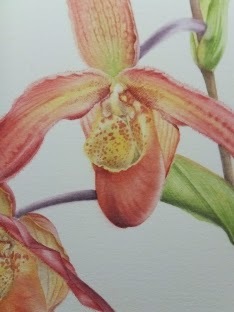 Now it's official, I can show everyone what the finished Phragmipedium Bel Royal painting looks like. It is one of the prizes at the Gala Dinner of the European Orchid Show & Conference. I wish I could go to the conference as it's the best place to see and buy the most extraordinary and beautiful Orchids. If you'd like to see the whole painting, there's a picture of it on the Facebook page of The Orchid society of Great Britain. Some great prizes on offer for the lucky diners.